Like every Thai restaurant I've been to in Chicago, In-on does some things better than others and I found the high points at In-on to be right up there with the best in the city. The fish w/herb salad is killer, loved the tart apple along with a full frontal spice punch. Crispy fried fish is a bit of an enigma in that despite being drenched in red curry, retains its texture. Pickled bamboo curry brought the funk and green bean salad had me glowing. I really liked the sour flavor on the fermented pork ribs but I was craving some meatier bites. To be fair, larb and mee krob are dishes you'll find in Thailand. Mee krob is sold in plastic bags everywhere in Bangkok - hugely popular. But the mee krob I tasted a few weeks ago paled in comparison to the one I tasted there about a year ago (and then about 10 months ago) so perhaps something's changed. Yes, it should have some sweetness to it, but also a sour component (and pork and hot pepper if it's really good). That being said, if you hate sweet Thai foods, probably not your thing. I haven't had the larb there yet so I cannot comment. But as this thread develops, I think everyone will get a better sense of what In-on does well and perhaps what it does not do as well. I suppose that I'm just glad that In-on is getting some interest here -- after I posted a year ago, the thread stood dormant for way too long. But I rank In-on among the upper echelon of Chicago Thai restaurants . . . and by the way, there are some really great Chicago Thai restaurants whose threads have remained dormant for far longer than a year. But I'll save that discussion for another day. The newest get together by BR here prompted me to write about the large group organized by Laikom a month or so ago. Let me say up front that it was awesome meal and thank Laikom once again for putting it together. Salads - All were very good, I think there was an eggplant and pork, a green bean and a fish one, but the dressings tasted almost identical (admittedly a peccadillo when it is that good) . I liked the addition of apple in the fish salad and I was surprised to find raw Thai eggplant to be so delicious. I found the pork in the eggplant version actually detracted from the dish, being relatively flavorless and not of pleasant texture. Fermented pork ribs - I can't add much that hasn't already been said. Interesting and enjoyable. Personally, I like my ribs braised to maintain some gelatinous texture rather the fried as they are here and I would prefer a bit more meat on dem bones. Bamboo shoot and chicken curry - Vies for our favorite dish of the night. Lately I have had a love affair with bamboo and combining it with a great red curry was a real treat. Dry curry fish - Tied with the above. This reminded me of a choo chee curry and with that expertly fried fish that stayed crispy even smothered in curry. Really fabulous. Fermented fish gut curry - I really liked the dirty flavors of this over some rice. Not nearly as funky as the name implies. The only downside are the small bones, but that is unfortunately how fermented fish innards are usually packed. I found a recipe for this in David Thompson's Thai Food and this meal inspired me to put it on my list of things to make some time. Tom yum - I thought this was completely unbalanced. I can handle pretty spicy food but this was overboard and underlying that was a pretty insipid tom yum broth. Pad thai - I haven't eaten this in a long time and I recall why now. This was an excellent version, but it just seems so much less interesting than all the other great Thai food you can get in Chicago now. Shu mai and skewers - Shu mai were unexpectedly good even if I would never order them at a Thai place. I could leave the skewers though, but that is just my general feeling toward such preparations and nothing against In-On-Thai. Crispy pork skins with relish - the relish here was very good, strong sour flavor (assuming tamarind) and I guess crispy pork skin is as good a delivery vehicle as any other. I think the relish app was a special? However, what is the crispy fish in curry dish actually called on the menu ? Also can you just ask for fried chicken in penang as that is not a standard option? 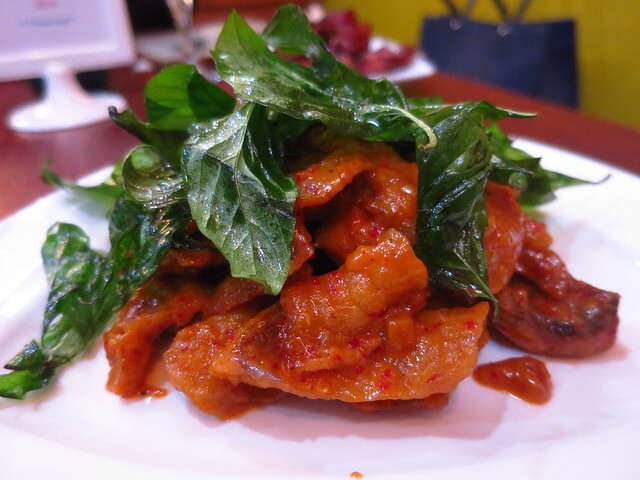 We also got the Thai name for that chicken and bamboo shoot curry: Kang Nor Mai Dong Kai. Keep in mind that Thai to English transliteration is not standardized if you search around for this, which is an unending source of annoyance. Also the order of the words here seems a bit haphazard. I believe Kang Dong is supposed to be red curry, so I am not sure why it is split up here. I enjoyed the killer dinner that BR organized this week. And though I punished myself with the spice– and they don't hold back here– it was one of my favorite Thai meals, probably ever. What excites me the most about this kitchen is their way with deeply developed sauces. Despite our glut of great Thai in town, I've quietly wished for more stand out saucy curry options. With the exception of Sticky Rice's Gang hung lay (which was a shadow of its former self on my last few visits) my other favorite curry dishes around town are dry (or dryish) like Aroy's Chu chee, Rainbow's Hor muk, and Andy's/TAC's Prik king. Even my favorite top tier spots seem to dilute the canned paste in coconut milk for their everyday menu curries. What I've tried here is clearly home made. The sauces here are fiery, indeed, but also layered, complex, and rich. Broths too. My favorite dish of this meal was, I believe, our second course (of 16), a preview of new "winter" menu item ~how cool is the fact that they offer seasonal menus! 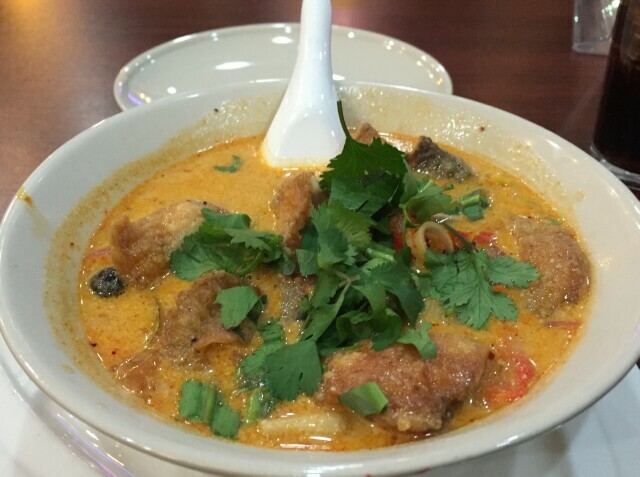 The soup was described by the owner as a tom yum fortified with cream, dairy not coconut. It had nice chunks of fried fish (which seems to be their star protein across the menu). To me, it was curry-like, very rich and thick from the cream but wildly aromatic, funky, and spicy from I'm guessing a judicious hand with shrimp and chile pastes. Just freakin awesome. The bamboo curry was probably my number two. Funky, sour, and hot. It was a bit thin on protein, but with the abundant rustic chunks of bamboo, it was substantial. The fish ball curry was another top notch saucy curry dish served in components- noodles, curry, garnish for each diner to custom compose. The balls themselves, home made and ordered in advance (for those of us who got to taste enough of them ) had great springy texture and a potent fish forward-ness. The crispy fish in curry definitely is of the crack category, employing their masterful fried fish, which although decadently delicious makes me ask if its too much of a good thing. Same for the fried chicken wings in penang curry, which came kind of late in the meal for their dialed up intensity. Probably a bad idea, but I could not keep my hands off of these and I got burnt. All of these sauced/ brothed dishes were at the top of my list. These guys also have a way with the wok. I'll let others chime in about the Bbq pork fried rice, a seemingly sleeper of a dish, which I thought was as good of a version as I've had with ample wok hay and a spiced up and soured flavor profile that leaves Cantonese stuff in the dust. I've never been much of a Pad thai guy, but this is one of the better versions, with similar attributes to the fried rice. The other noodle- based sleeper is the Baked shrimp with clear noodles with a nice sesame oil profile and some surprising dolsot- esque crispy, toasty noodles on the bottom of the pot. As in my first visit, there seems to be weak spots on this menu (which were ordered in a far lesser ratio on this visit). The beef dishes were just not fresh tasting, with off-the-line rubbery stir fry meat. And the Hor muk, which might be a good dish if we didn't have such elegant, nuanced versions to compare to this relatively ham-fisted chunky version. But overall, I'm now ready to add this place to the pantheon of my Thai rotation, a set of restaurants that serve some of my very favorite foods in Chicago. Unless something has changed, In-On is only open for lunch on weekends, anyway. Aroy is open, though (I'm told the remodeling is over). Ronnie is correct, also Wednesday is their day off. They are open for dinner on Monday. Lunch is only Sat and Sun. Hmm maybe I'll give Aroy a third chance then. Wait, they are closed for repairs. Looks like I am destined not to have thai food today. Octarine wrote: Wait, they are closed for repairs. No they are not. I called. Jefe wrote: I enjoyed the killer dinner that BR organized this week. And though I punished myself with the spice– and they don't hold back here– it was one of my favorite Thai meals, probably ever. Thanks for putting most of my thoughts to words. I'll just add a few comments. Thanks also to BR for setting this up. We counted 16 courses, and who else are you gonna be able to go out for 16 courses with? And speaking of thanks, MattZ's home-brews went especially well with the dinner, so how else ya gonna do that too? But was it my favorite Thai meal ever? Well, given that I have been to Thailand and all, not sure about all time. I think all time will require some of the seafood, like the giant shrimps one gets in Bangkok. Also, all time needs a real charcoal grill. As good as the fish with herbs was the other night, my memory of whole grilled catfish with herbs at Lotus of Siam exceeds. OK, so all time is a too high of a standard. Great stuff here. Great most in those sauces and broths. Man did I enjoy the sauce for the crispy fish. Not only were the flavors complex, with a strong undercurrent of garlic supporting the whole mess, but it was texturally complex too, what only hand pounding can accomplish. And that soup, it was so bright, someone thought it was huge does of lime and tamarind; that brightness carried all the flavors accross my palate in such a pleasant way. It should also be noted that the owners here really enjoyed our company and made us feel most welcome. I would say that I felt like I was eating in their home, the way the food came across. Precisely. There's a "darling" mentality here such that if someone does not like or has a different position on a "darling" the person is rejected out of hand. You guys should keep your minds open more. 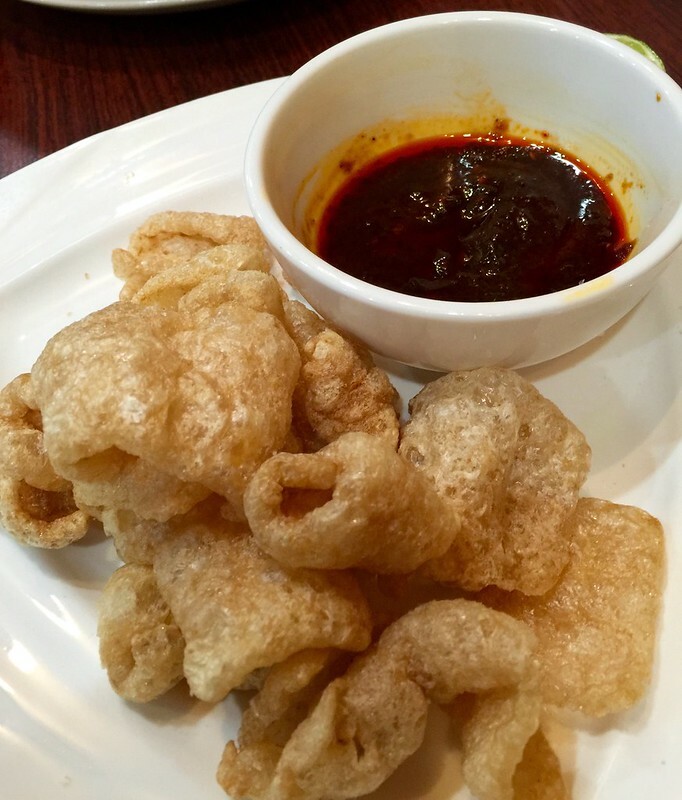 We had the crispy pork rinds with shrimp paste dip at the group dinner I organized recently, but there's no picture of it . . . until now. It's served with lime for acidity and makes a good start to any meal while you're perusing the menu (or at home in front of the tv). My dining companion had also ordered this crispy tofu. Though I didn't want this -- sounded boring to me -- I actually enjoyed it quite a bit. It would make a nice companion order to a fiery, hot dish. 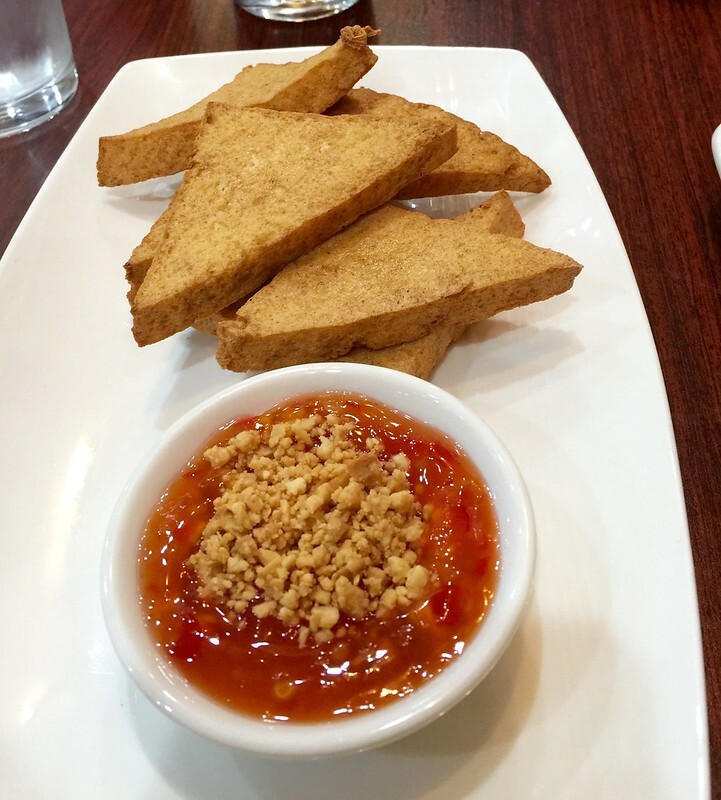 The tofu has a lightly creamy interior, and I enjoyed abundance of peanuts in the sweet dipping sauce. Simple, not exciting, but very comforting. There was more to our dinner, but you've seen and heard enough about the other dishes elsewhere here. Just finishing another wonderful meal. This place is a treasure. It pains me to be the only table on this Tuesday night. I've had a few new items on my last trips to In On Thai. Last night we were given a wasabi shrimp salad, which will appear on the blackboard as a special tonight. This was a refreshing (but also hot and spicy) dish with Chinese celery, lemongrass, celery leaves, wasabi (not fresh), green chili, a few elements that I do not recall and In On Thai's perfectly cooked shrimp. It was really good, and would make a nice start to a meal. In addition, the much loved marinated pork spare ribs have also changed a bit, as they have grown to full ribs instead of hacked up bits. As good as the small bits were, this represents a change for the better. Finally, we tried an excellent pork belly dish (in five spice? ), which I think was on the one page seasonal specials menu. It was a mild dish, which represented a pleasant change of pace from many of the spicier dishes we received. The dining room was pretty full for most of the evening, with at least one other set of LTH'ers and a brisk carry out business. I can't speak highly enough of In On Thai. The food is always exciting and the owners make you feel like you are guests in their home. In On Thai, count me a fan! In-On Thai is at 3821 N. Broadway, part of the same complex, so I would assume they'll have to beging searching for a new home. Someone please report back when you've spoken to the folks there and they have something to say about an eventual new location. In the meantime, keep supporting them so they'll have $$$ for a move. I was there Saturday afternoon for another stellar lunch. I'm happy to say, they were doing pretty good business. I sure hope they are on top of this and don't get blindsided at the last minute. This is one of those places I never would have considered were it not for LTH. I live close to Arroy and close enough to Rainbow that I generally don't feel any need to go beyond walking distance for Thai food. But wow am I glad I made it to In-On Thai on Friday. I'm already plotting my return. Actually, several returns since, as was speculated above and confirmed at the restaurant, they're going to have to find a new home due to the building getting torn down. One tip for people to not make the mistake I did. Save the fish with herb salad and the kaeng nor mai/gang naw mai/"fermented bamboo with chicken" for the end because those have some strong flavors that can't be matched by some of the more subtle dishes like the outstanding green curry and the definitely-worth-trying-once-and-possibly-worth-a-repeat-once-I-figure-it-out fish custard. A group of 6 of us dined at In-On Thai last night. Darn convenient to have a liquor store next door. While I wanted to order one of the curries, pad thai was requested as a non-heat dish and was quite a good one to pick, very enjoyable, helped the heat excited taste buds to calm down. Our table thought the In-On Thai crispy fish w/fried basil was just ok as was the Sunshine Beef as all the moisture was cooked out of the beef (it is jerky but seemed over fried). Highlights for our table were the Fish Custard and Fish w/Herb Salad, stunners. Looks like Rainbow Thai has serious competition. I thought their green bean salad and the spicy fish (fried fish with dry-ish red curry sauce) were amazing and comparable to anything I've had at Rainbow (I can't believe I'm saying that). I'm definitely going back to try more things. Thanks to this informative thread I've been nothing but satisfied on two separate visits. The second of which left me wondering why we (me and she) don't eat here more often. Stuck to the board favorites each trip in and dug the Green Bean Salad, Fermented Pork Ribs, Green Curry. But the House Special Crispy Fish with Fried Basil is fast becoming an all time favorite dish. Love the texture and the flavors. I really need to try the other fried fish options but that one currently has me hooked. Run don't walk to In-on Thai Restaurant for Crispy Fish in spicy milky broth from the Winter Special menu. Fine line between eye widening heat and delicate balance. 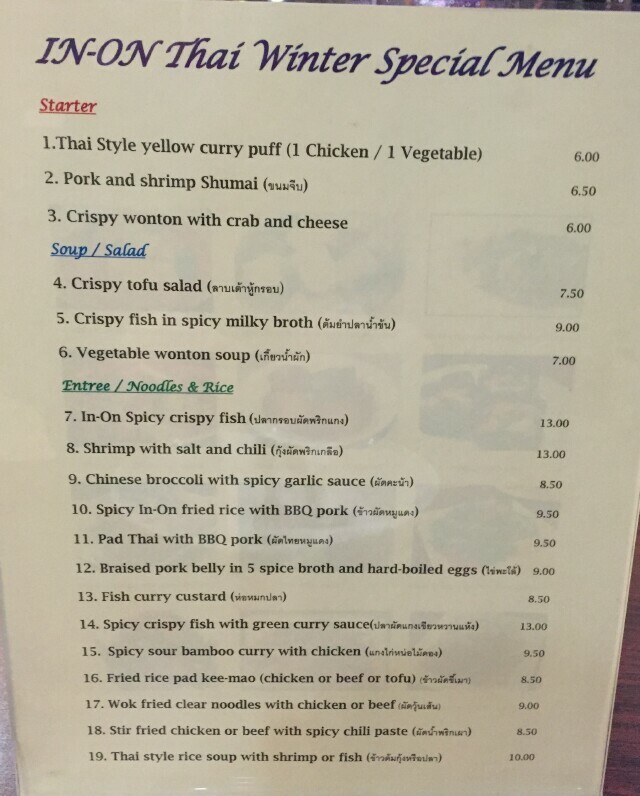 G Wiv wrote: Run don't walk to In-on Thai Restaurant for Crispy Fish in spicy milky broth from the Winter Special menu. Fine line between eye widening heat and delicate balance. serves me right, I was waiting until the last dish to order this and by then we were so full that we couldn't eat another bite. Mrs Willie, parents & I ate at In-On Thai tonight. All the above were as good as ever. curry puff, My pop really wanted this, so of course he got it. We tasted, not worth the bite. Fermented pork ribs were not good at all. No flavor & overcooked. A real downer after our table ordering extra of these the last time we went. Finally got here again after the wonderful meal that Laikom put together. So freaking good. The best thai salads in the city IMO and I echo Gwiv's comments on the fish soup, amazing. Also tried the penang with fried chicken. I like the chicken texture, but the whole dish was a bit too salt and I did not find the curry itself particularly memorable. Dinner last night consisted of the fried fish with Thai herb salad, spicy crispy fish with green curry sauce, pad Thai with BBQ pork, and the pork ribs. All four dishes were excellent, but the two fish dishes were a cut above. Based on previous visits, seafood seems to be their strength. IOT's green fish curry is about the best I've tasted outside Thailand. Their fine curries make them a destination restaurant for me. We had this last night and it was fantastic. My Thai is pretty bad . . . worse reading/writing . . . though I'd venture to guess that this is tom kha pla, the sibling to the well known tom kha kai. Either way, highly recommended. They also have a special salad, spicy crunchy trio or something like that. It was also very good and would probably appeal to fans of nam prik pao. I can't recall all of the crunchy bits (pork rinds perhaps but fish too I think) and certainly shrimp paste, but acid and herbs too. I've posted good things about this place and I assume it is destined for GNR status, which is likely deserved on the strength of the hand-pounded curries alone. They also seem to have a way with frying fish - usually. But I have to note the God-awful meal these guys delivered to me 2 days ago, because it was one of the poorest Thai spreads I can remember and I hope that what my family experienced was either a one-off or a short term issue that can be fixed. I want to believe this is not a Spoon-like problem (which problem was later fixed, for the record, but not before damage was done). Insipid, mushy and undercooked, underseasoned pad siew with dry chicken and, apparently, food service (American) broccoli and carrot mix; moo pa lo with one huge, uncut pickled green and the bone from a pork shank, sans meat; and the crispy fish curry. When knuckleheads on TV say they'd eat a flip flop, or an old tire, or a hockey puck with this or that sauce on it, because this or that sauce is so damn good, well, I never took them literally. But there I was. Re-fried, leathery chips of muddy-tasting pond critters were eventually scraped of their precious red curry ambrosia, which was enjoyed on (perhaps most noteworthy) overcooked, waterlogged jasmine rice. Let me just say this-- there's no way in hell that anyone who had anything to do with the production of the curry that day was in the kitchen, or probably on the block, when my particular meal was put together. My hope for everyone is that the imposter who hijacked In-on Thai's kitchen for a short time a few days ago has been found out and brought to justice. These incredible Thai places really depend on the cook. When he or she takes a powder, sometimes you know it. I think Laikom mentioned that mom, who handles the brunt of the cooking, was out for a bit--not sure exactly when--or how long it lasted. Not sure if that's what led to your order. I ordered in from them last night as well. I only ordered the chicken with bamboo curry and the green bean salad--SO got his usual red curry with ground chicken sans the Thai eggplant that he, sadly, doesn't like and an order of shumai. The chicken with bamboo was great--the chicken is clearly not the standard issue leathery strips of white meat that most places serve--it was definitely dark meat, roasted and completely delicious--though an unbalanced ratio of meat to bamboo (probably not more than a couple of ounces of meat and a LOT of uncut, unwieldy sheets of bamboo). Not necessarily a complaint--i'm actually ok with meat as a condiment, particularly when it's above average quality--but a warning if anyone is expecting something different. The green bean salad was phenomenal--full of ground pork, perfect cooked shrimp, funky, spicy and satisfying. Shumai were unremarkable-ordered for SO. And I didn't try his curry--without the eggplant, it's mostly sauce and a bit of meat. He prefers Rainbow and Aroy's versions. My main concern about I-O-T these days is whether they'll find new digs before they have to leave their current location and if they can maybe train some additional staff to help mom in the kitchen. Hoping for good things on both fronts! Another great meal at In-On Thai last night. Nothing new to report on the food front but I did pick up an important nugget of information. Our server told us the new location is going to be at Clark and Lawrence. No word on the actual date of the opening.